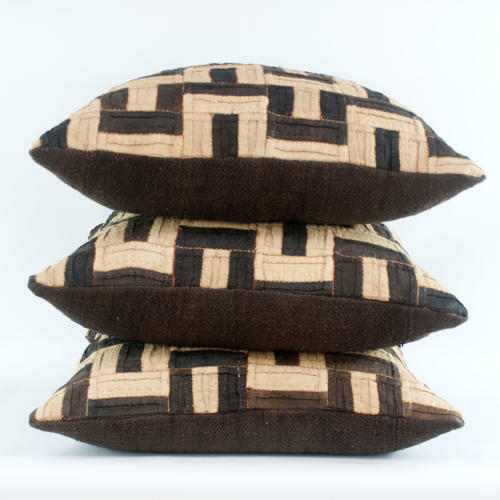 These graphic cushions are made from a Kuba cloth dance skirt. The Kuba people from the Congo have made this iconic cloth for centuries from the raphia palm. It is dyed a variety of earth tones using vegetable dyes. This cloth is a flat weave, and the Kuba are also known for making a cut pile faux velvet finish. The cushions are backed with dark brown hand dyed antique hemp, have zip closure and feather pad. These cushions are not recommended for heavy use due to the number of seams in the cloth. There are 2 remaining and they can be viewed in my studio in Purley by appointment or please ask for a shipping quote.